I stumbled upon In Vain" title="Search for In Vain"> In Vain during my search for reviews on various websites to find some interesting new tunes to jam to. 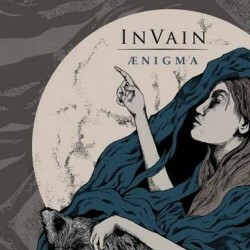 In Vain wasn’t a name that rang a bell, but that could also be the case of the very generic band name. Clearly this is already there third full length, so it might have slipped my attention in the flood of monthly releases. The first listen of the stream of Aenigma at that particular website didn’t persuade me to pick it up or listen to it more often. The progressive death metal with some black influences struck me as a run-of-the-mill band without really interesting song material. Luckily I was stubborn enough to give it an additional spin and with my headphones on (my girlfriend was viewing some kind of crime series on television, so I am sometimes forced to listen to the noise (as she describes it) through headphones) I delved into Aenigma. After that spin the album really opened up to me and I can understand what all the fuzz is about. This is progressive death played in a very interesting manner. They use the roughness of death metal, the eeriness of black and give it a modern and progressive touch by using keys. Of course this is not something new, but I haven’t heard a lot of bands in this genre that are able to write such captivating song material. It feels like you discover new elements with every subsequent listen. I can’t really pinpoint what it is that makes this release so grand. It could be the variety between the songs and within the songs. I am a sucker for albums that give enough variation to keep me interested. Also the production is very clear without sounding too slick. I am glad that they haven’t chosen a more filthy and murky production, which is sometimes the norm in underground circles. Another thing that stand out are the clean vocals. Normally with these kind of bands, the clean vocals sound gimmicky or just horrible, but not with In Vain" title="Search for In Vain"> In Vain. They show that when done in the right manner clean vocals can work out in a more extreme metal genre. I could go on and on about the various interesting aspects of this release, but I think that a must buy recommendation will be sufficient. I am not too fond of the more extreme metal genres, but I´m happy to make an exception for this killer album!